We had a lovely Christmas Eve at home this year. Following tradition, Nate helped me make sugar cookies for Santa, though he was a little less enthusiastic this year. We had a pretty awesome turkey dinner (if I do say so myself! ), and I harassed my family for pictures. My real camera is broken (sad face) and the kids were not interested in making Kodak moments anyway. In the picture above, you'll notice Nate hiding behind his sister. This was moments before her star related meltdown. (I decided that she shouldn't play with it because it was getting glitter everywhere and she strongly disagreed with this decision.) 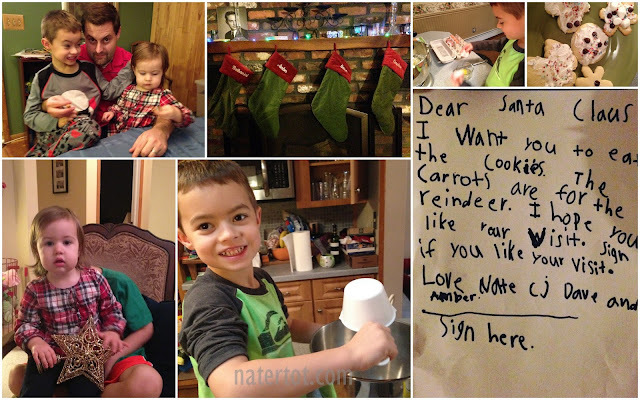 But I think Nate's note to Santa made up for the lack of awesome family portraits. Also per Field/LoRe tradition, we each opened one present on Christmas "Eve" which was more like 3:00 p.m. Nate passed out the sweet gifts he purchased at his school holiday shop and I received a lovely "#1 Mom" bracelet. Nate choose to open the package from Bubba that he correctly deduced was Legos. Scooby Dooby Doo! !